Classic fuzz and overdrive sound tones in a board-friendly smaller size. 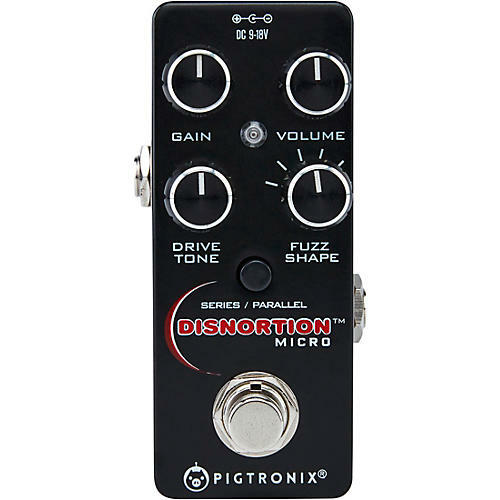 Pigtronix Disnortion Micro packs all the sonic glory and 18v headroom of the original analog Fuzz and Overdrive circuits from the large-format Disnortion pedal into a miniature version that runs on 9-volts. The original, 3-footswitch Disnortion pedal was in production from 2005 to 2015 and remains in constant use with world-class bands such as Queens of the Stone Age, Aerosmith, Living Colour and Muse. In response to a decade’s worth of customer feedback, we proudly update this classic analog stompbox with the introduction of the Pigtronix Disnortion Micro. This new micro version of the Disnortion hugely one-ups the original’s broad palette of touch responsive dirt sounds by including the ability to switch from a parallel routing to a new, super-saturated series routing where the 6-stage CMOS overdrive circuit is cascaded into our unique diode clipping fuzz and output through a 6-way passive filter network. A single gain knob controls the saturation of both the fuzz and overdrive circuits simultaneously. The Parallel routing mode is ideal for players who like to pile on the gain without sacrificing clarity, dynamic response, punch or low end - it’s like double tracking your guitar inside a micro pedal! The Series routing mode offers an even wider range of gain and more extreme filter effects for metal tones and beyond, including self-oscillating timbres that can be modulated by pickup selection and guitar control settings. The CMOS overdrive found in the Disnortion Micro responds to the dynamics of your playing using a unique, 6-stage gain architecture that retains the natural tone of your instrument while adding tube-style breakup as you play louder. Pigtronix Fuzz has a unique diode-clipping architecture designed to deliver compression and controllable feedback while preserving the dynamics of your playing style. The rotary tone control filter switch provides 6 musical EQ curves using a complex passive network which compliments the Overdrive channel’s traditional low-pass filter. The original Pigtronix Disnortion is loved for its limitless headroom, making it compatible with any instrument, from the weakest '60s pawnshop single-coils the most belligerent humbuckers as well as 5-string active basses and modern synth rigs. Pigtronix Disnortion Micro achieves this world-class performance standard using standard 9v power—and it fits in your pocket.